When we went to AG Chicago we were going to get Lea’s celebration dress for me. I love that dress. After I tried it on though, we saw this one. Mom asked if I wanted to try it on. I said sure, and we decided we liked this one better. So it came home with us. I love how it looks, and it is very comfortable. It’s kind of a fancy dress, but I can wear it for school. 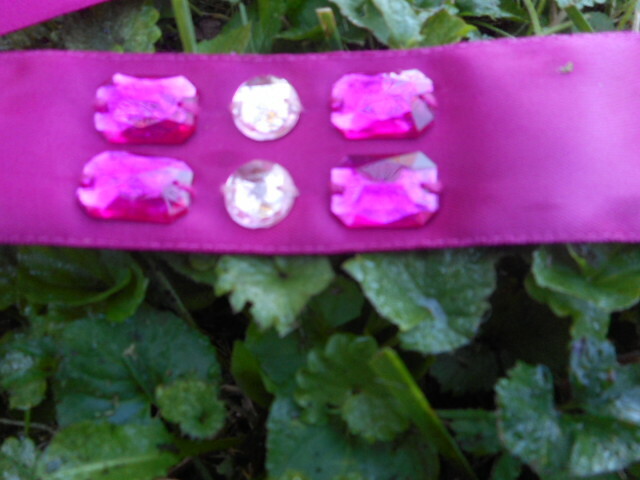 The ribbon has six plastic and metal jewels on it. I like how it has a little bit of decoration, but not the bows and flowers they always go overboard on. 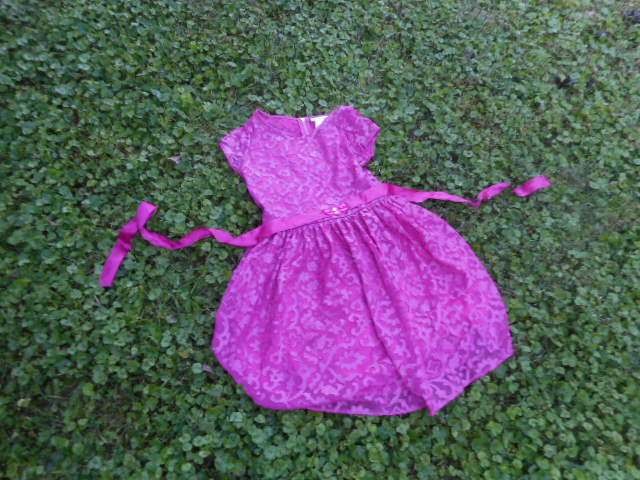 The top layer is a layer of tulle with fabric (I’d call it plether, plastic leather) designs sew on. I love this. It’s so different from what they usually do. It’s light, and it still twirls well. And it is more durable than printed tulle. 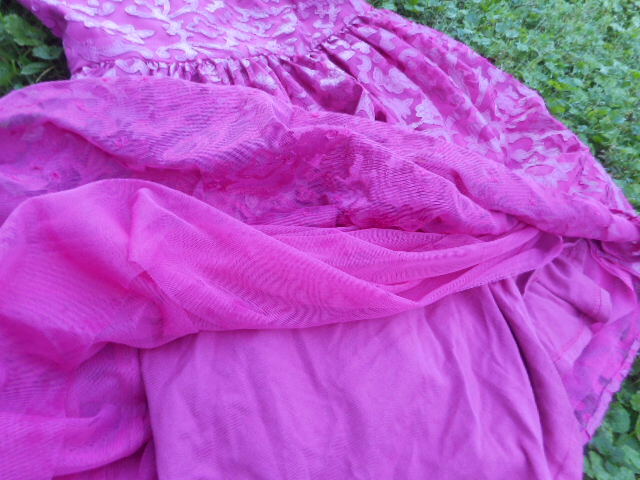 The top layer is tulle with plether, the second and third are more tulle, and the fourth is a stretchy cloth, like legging or T shirt cloth. A metal *AMERICAN GIRL tag is sewn on. I like how they did the zipper. It shows, but it is easy to zip and unzip. It is metal instead of plastic, which is a plus. On my family’s vacation we went to the American Girl store in Chicago. 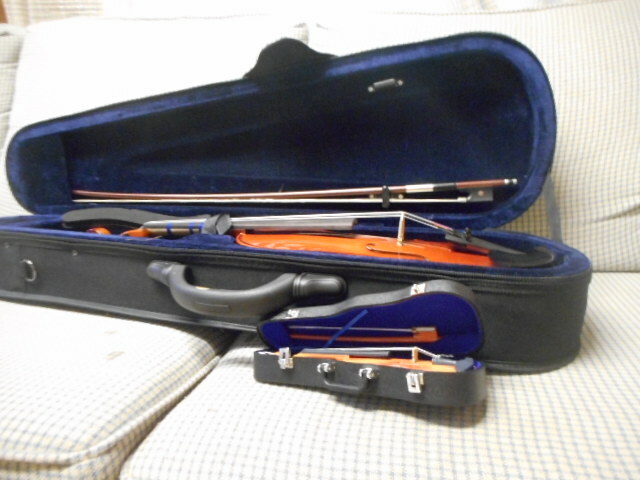 The violin set had been on my list of things since I got a violin of my own. 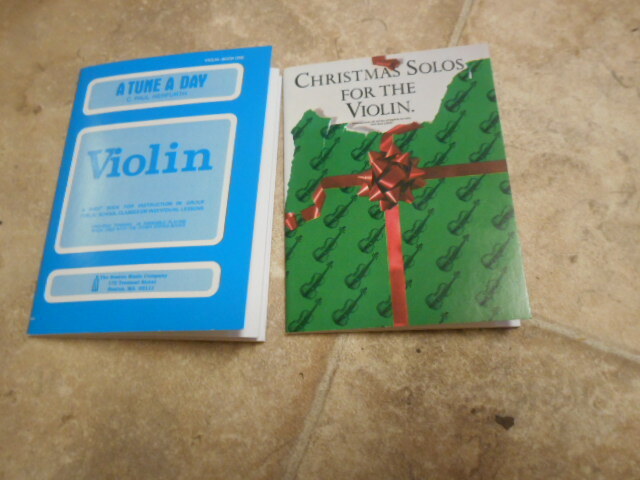 I was trying to decide between the cupcake set and the Violin. (Note to self-decide what to get before you go to an american girl store.) I had money for both, but I didn’t want to spend all my money. 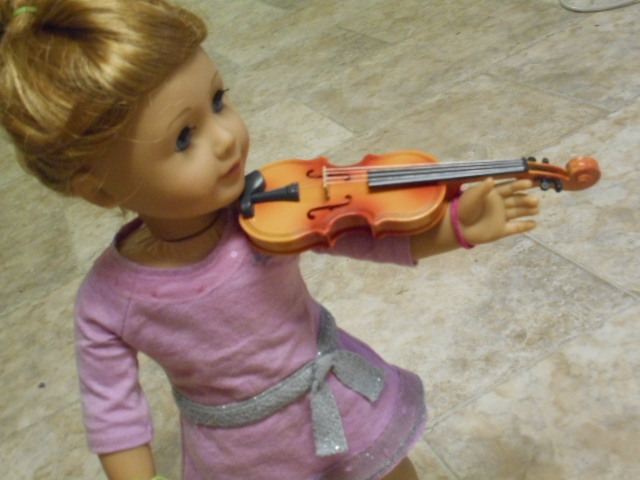 I decided on the violin set because my dolls already have cupcakes. 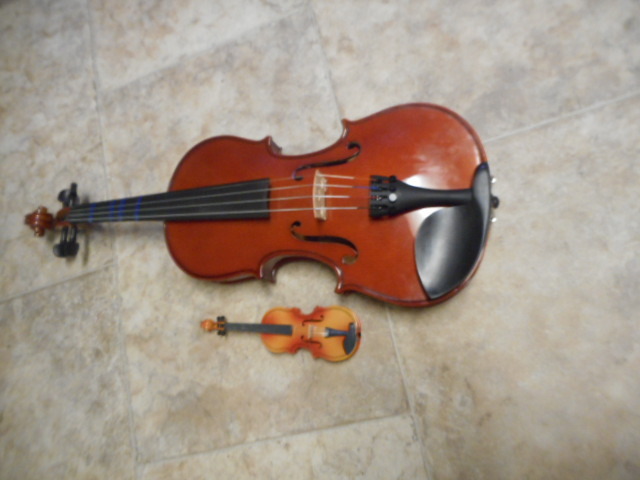 It is the first day of school for me, so I decided to review the violin set and compare it with my violin. 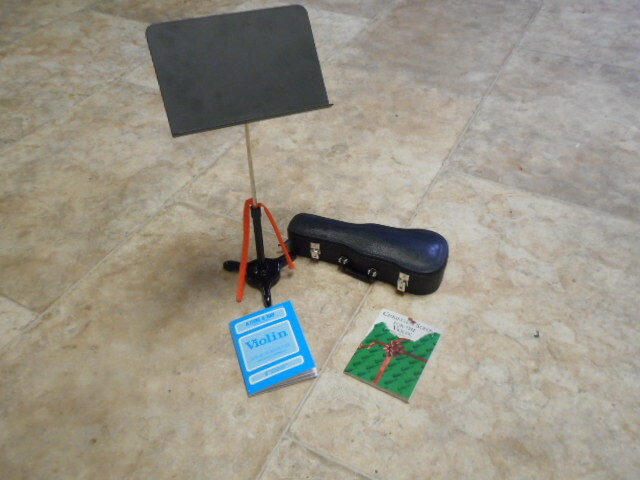 The set is $34 and it comes with a music stand, two books, rosin, a case, a bow, and of course, a violin. 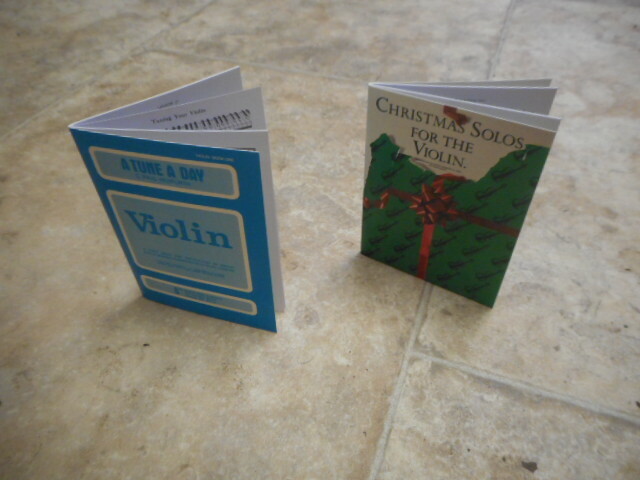 One of the books is a theory book, and the other is a Christmas song book. They both stand up on their own. 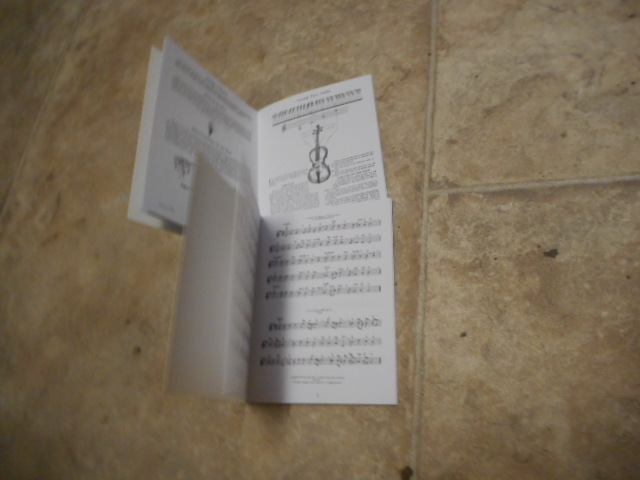 I HATE theory books, but the books are actual books, with real music. 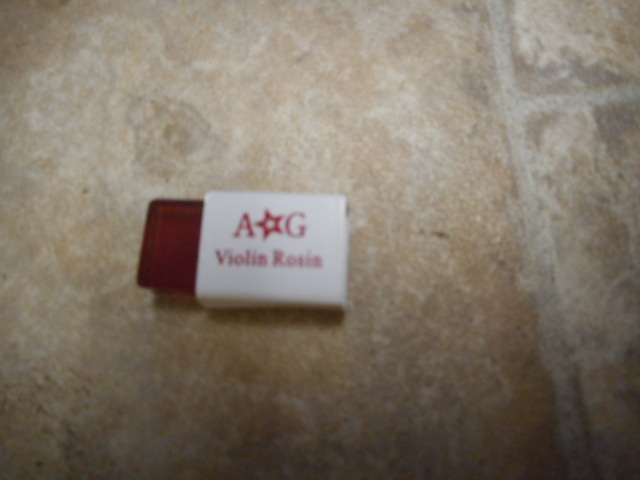 The set comes with a little block of rosin in a case. I don’t like this. 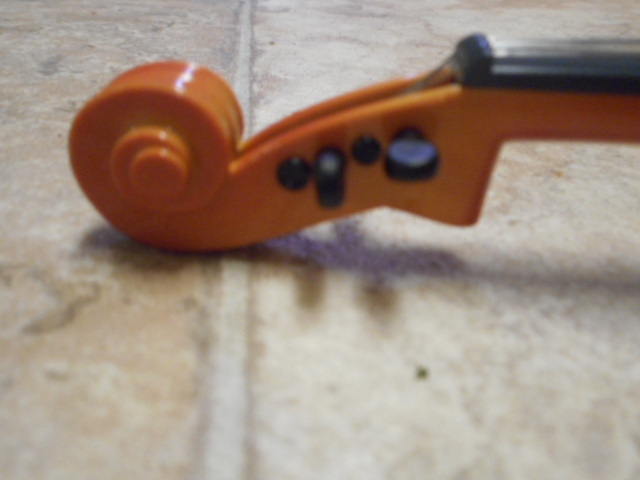 It would make the rosin really hard to use. 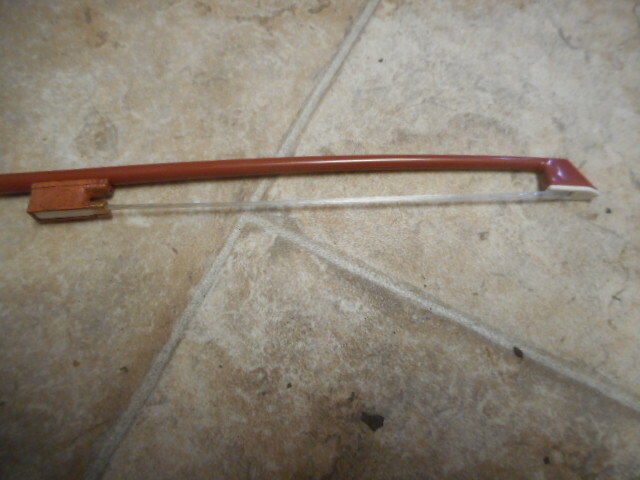 The bow is made out of plastic, with plastic strings. The little thing at the end turns, but doesn’t do anything. I was happy to see the case. Although it doesn’t open very much it is well made. 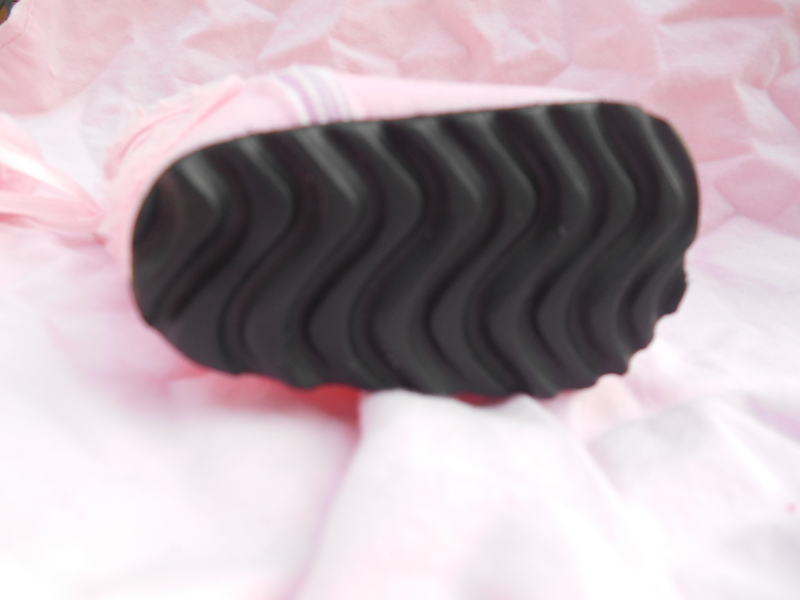 The outside is a durable plastic, textured to look like leather. 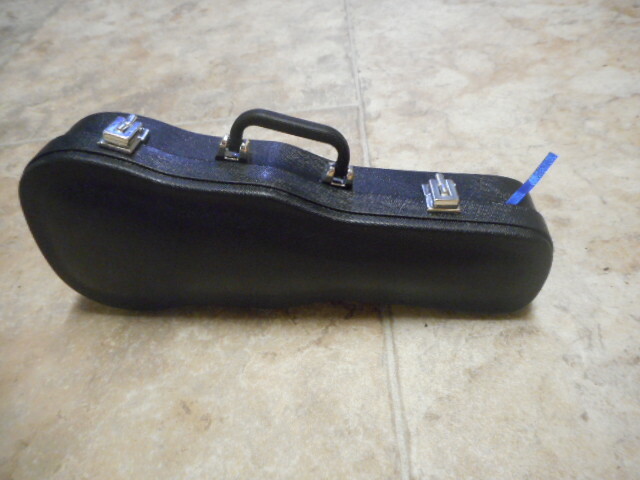 The inside is blue fuzzy material, with two ribbons to tie the violin in. The handle turns, and the plastic buckles close. 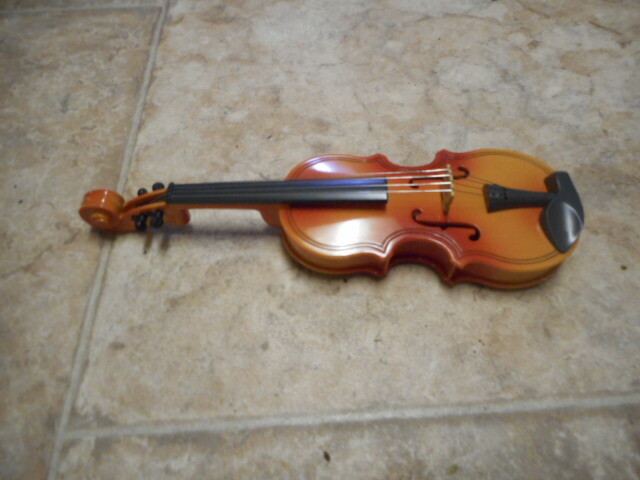 Now we have the violin. Although it is plastic, it is very nice. 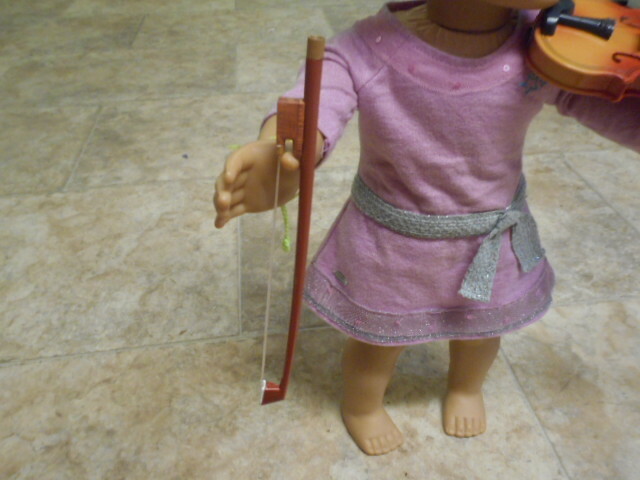 The strings make noise, although the bow won’t. 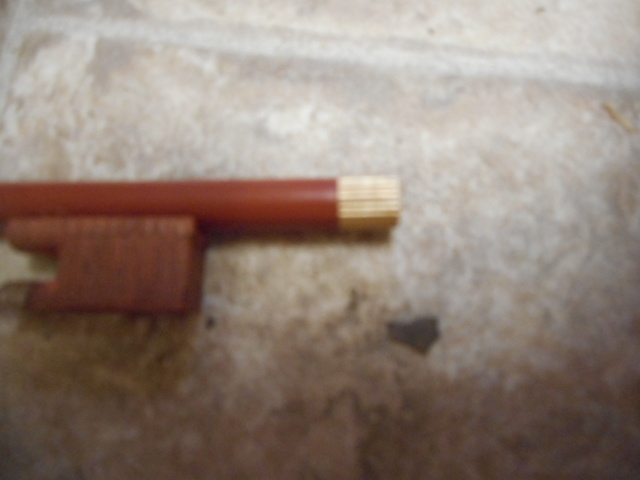 There is nice scroll work, and the tuners really turn. 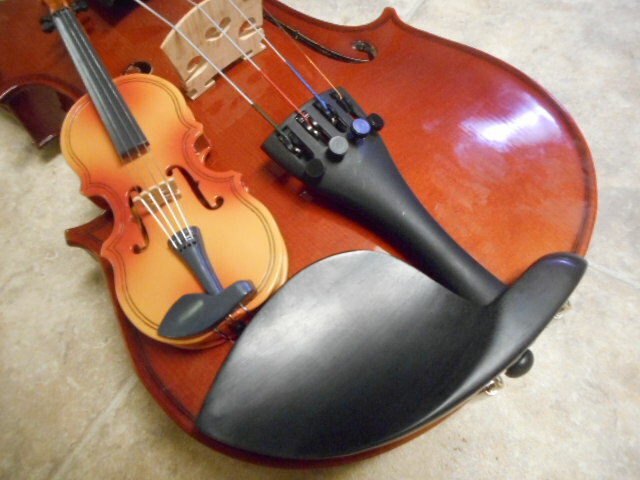 There is a shoulder rest too. The last thing is the stand. It is made out of metal, and I LOVE LOVE LOVE LOVE this piece. 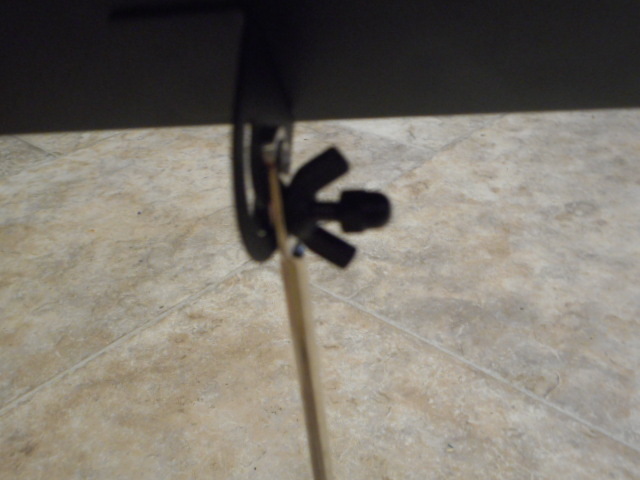 A bolt thing is underneath so you can rotate the holderything. The books actually fit on the stand. The pole is supposed to be adjustable, but it wouldn’t stay in place so I tied a rubber balloon to it, so I can slide it around and keep it where I want it. 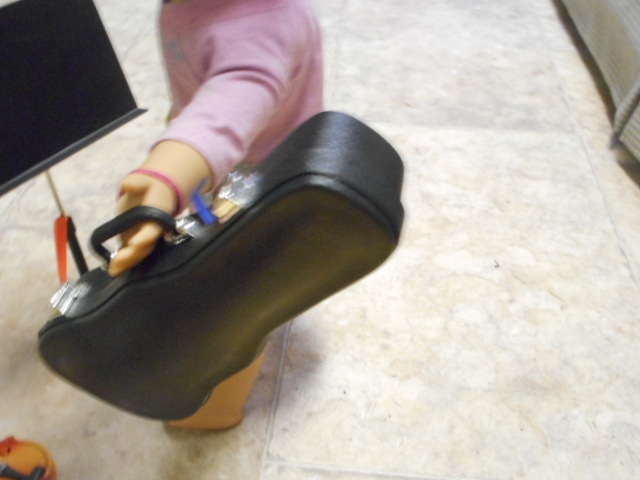 Eileen can kind of hold the case, but she can’t stand. 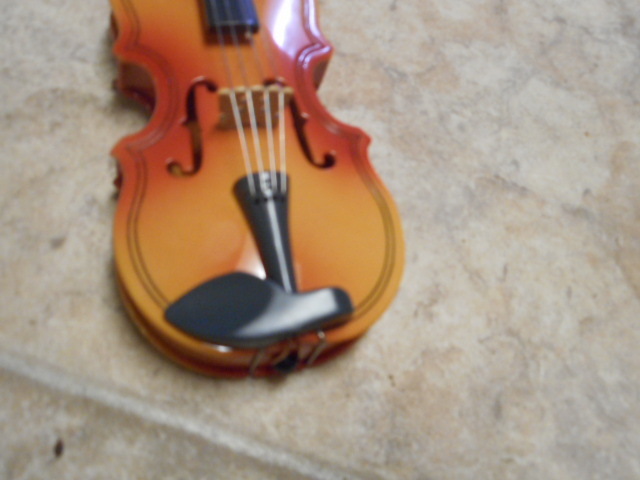 I love that the violin can be held if you adjust it right. She can hold the bow. But this is the closest she can get to playing it. I put the cases side by side. 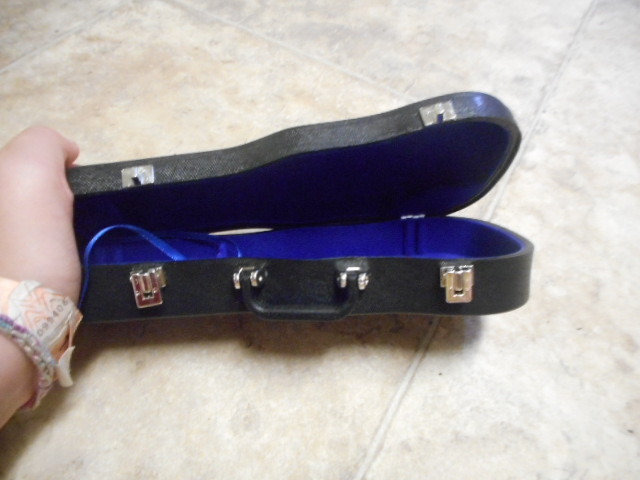 Mine is blue also, but it has room for two bows, a pocket for the rosin, and velcro instead of ribbon. 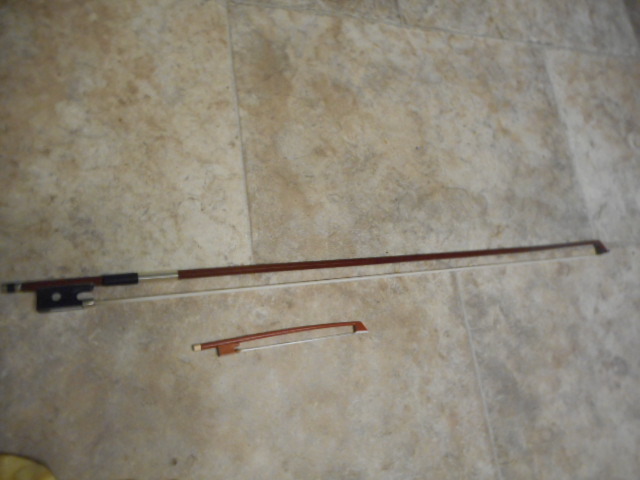 The bows side by side. And the rosin. 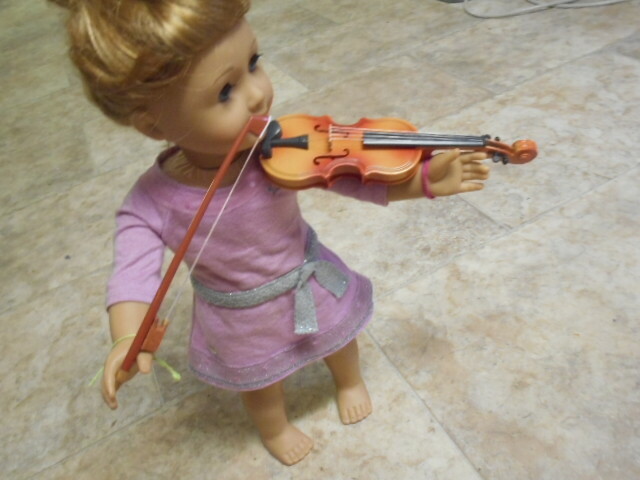 The doll violin looks a lot like mine. They both have a shoulder rest. And they both are fun to play with. I wish it had come with a shoulder rest. 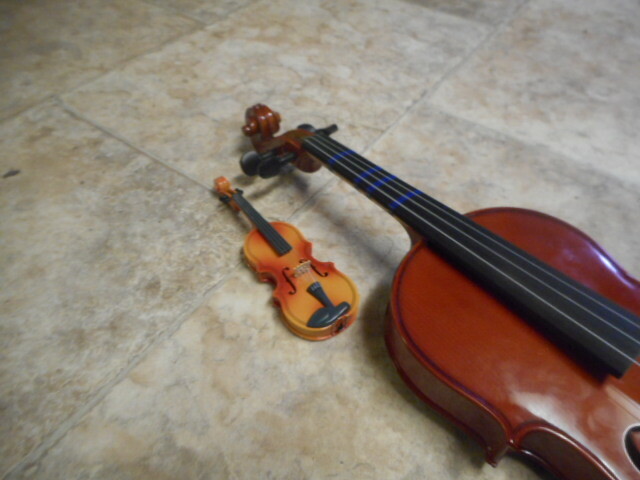 I can’t play my violin without it, but the set didn’t come with one, so I guess I will just have to make one. 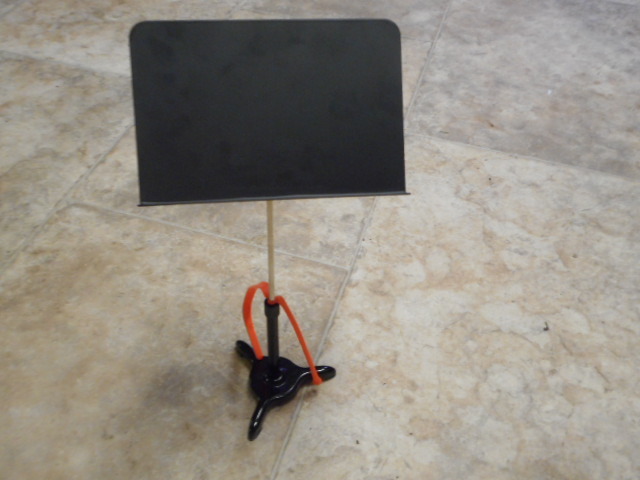 I give this set 4/5 stars, for the stand, the rosin and no shoulder rest. Other than that I love the whole set. I think the price is very reasonable, as there is a lot of pieces, and most of them are well made. 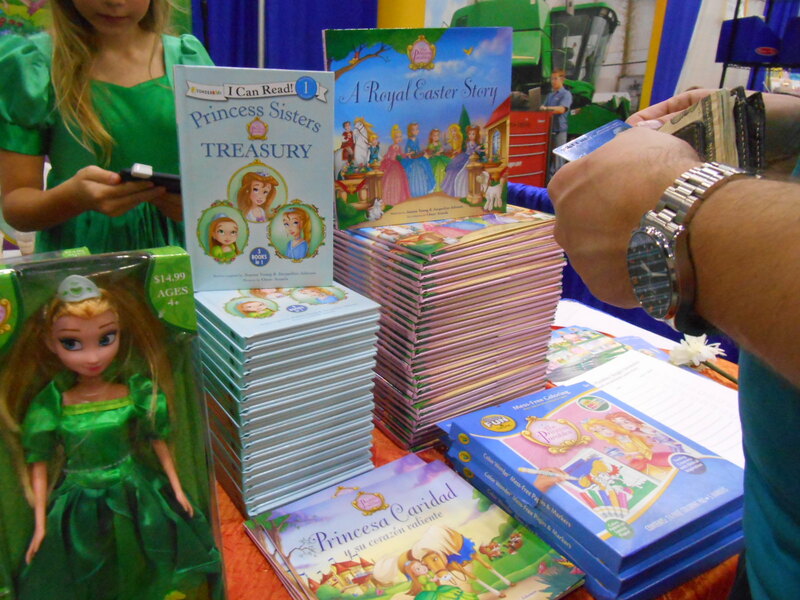 At our local homeschool convention, just like last year Princess Parables was there. 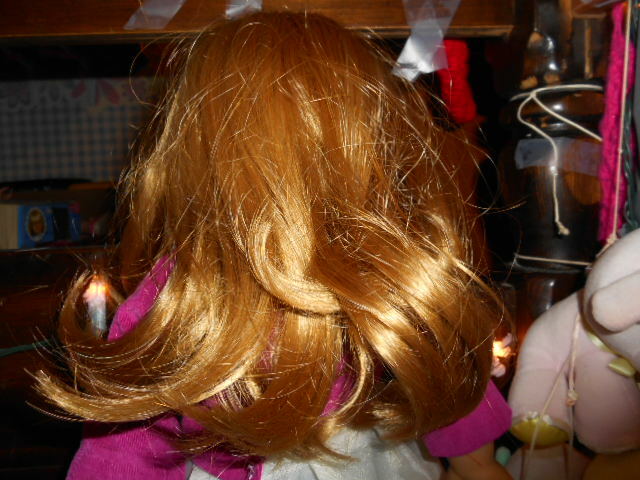 This year I bought one of the dolls to review. 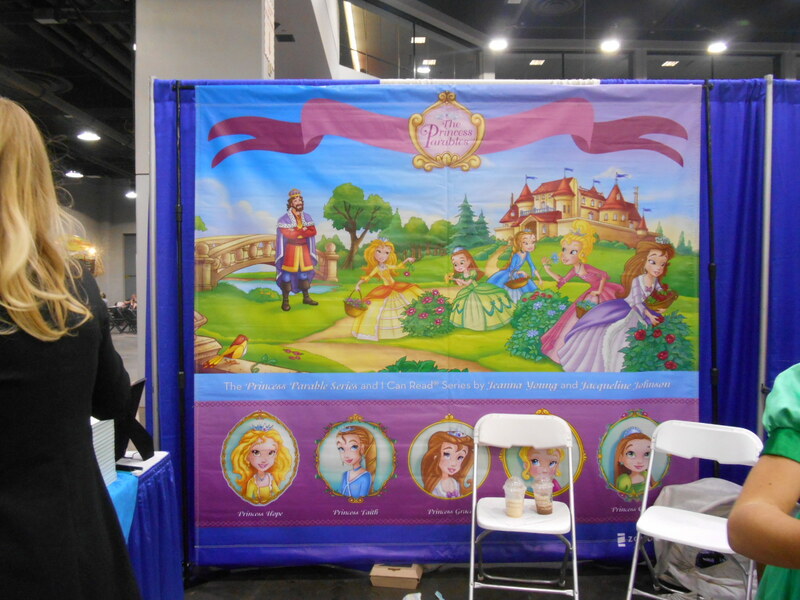 Here are some pictures of the booth though. 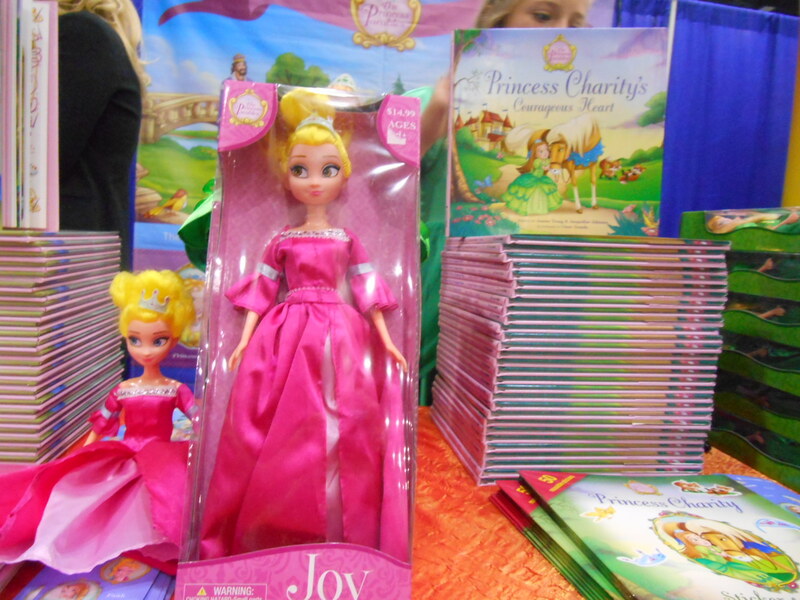 There are five dolls, Joy, hope, Faith, Charity, and I don’t know if I have a picture of Grace. Here’s the big banner. And another picture. 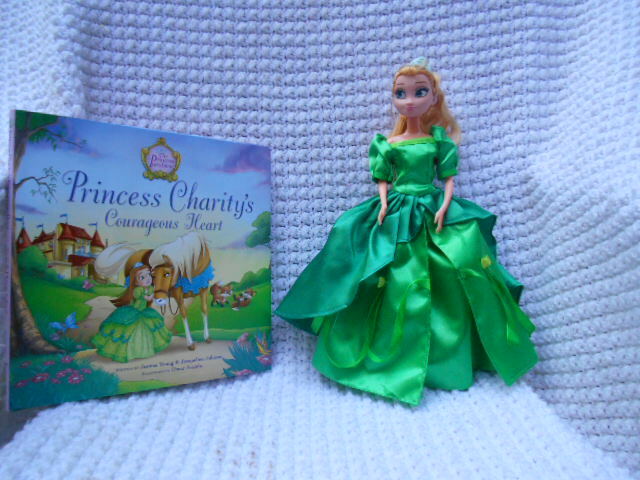 I bought Charity and her book. 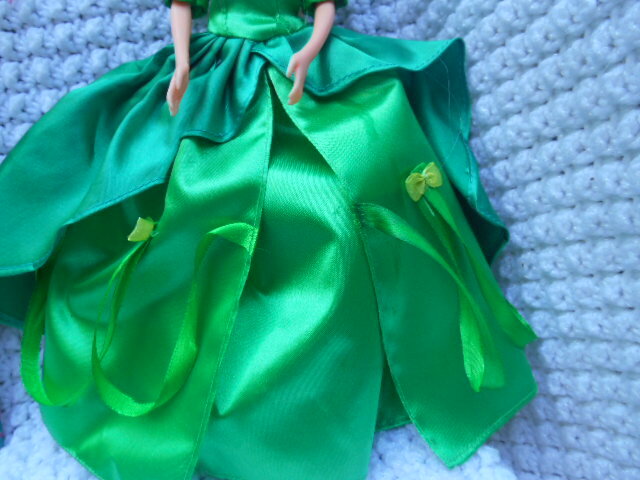 I like her story, the green is nice, and I don’t have any other dolls named Charity. I’ll review the book first. 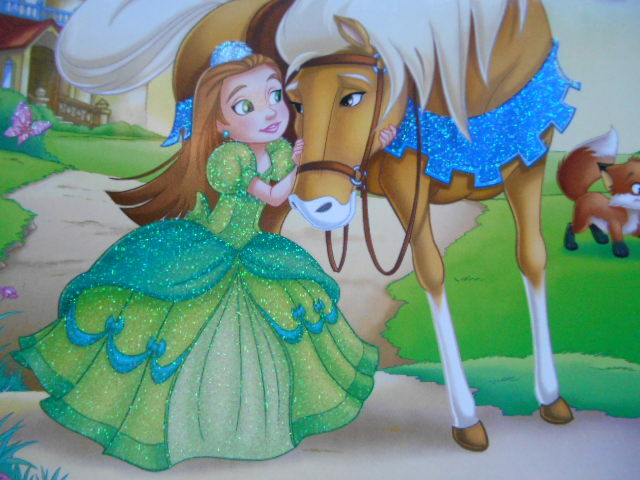 The cover of the book shows Charity in a glittery dress with her horse. 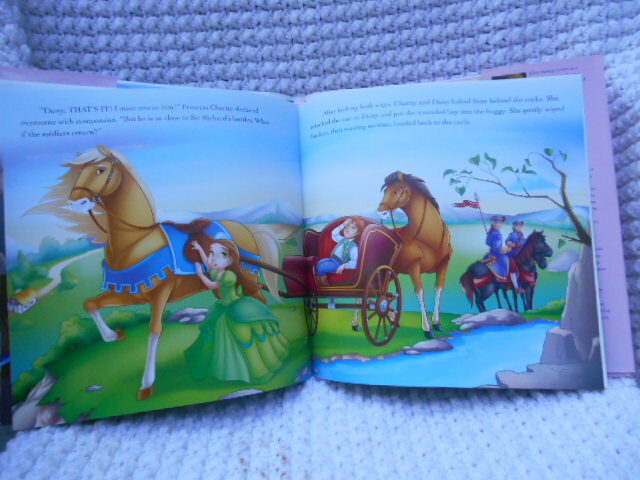 This book is about how Charity’s dad tells her not to go to her uncles land. When she goes out exploring she finds a hurt boy very close to his land, and she wants to help him, but she is worried she will get in trouble. She does anyway, and the brothers become friends again. I think the plot could have been better, but I like that it is after a a parable. In this picture Charity is wearing boots. Here is a picture of her helping. And some explaining at the end. 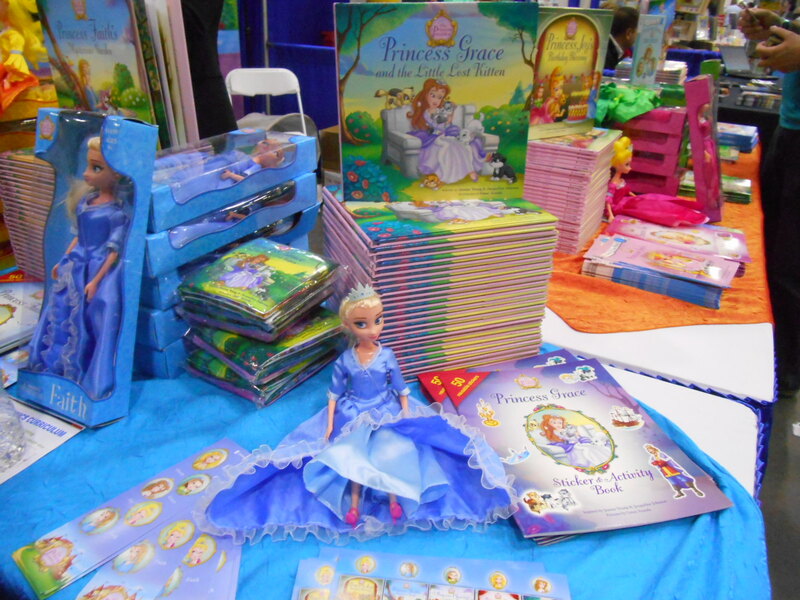 The book is well written, but appeals to younger girls than me, and I don’t find it very interesting. Now on to Charity! 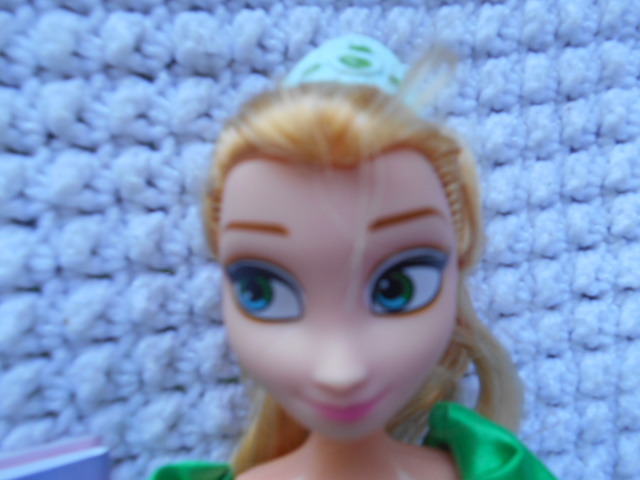 Charity has a heart shaped face, line eyebrows, blue and green eyes looking to her left. 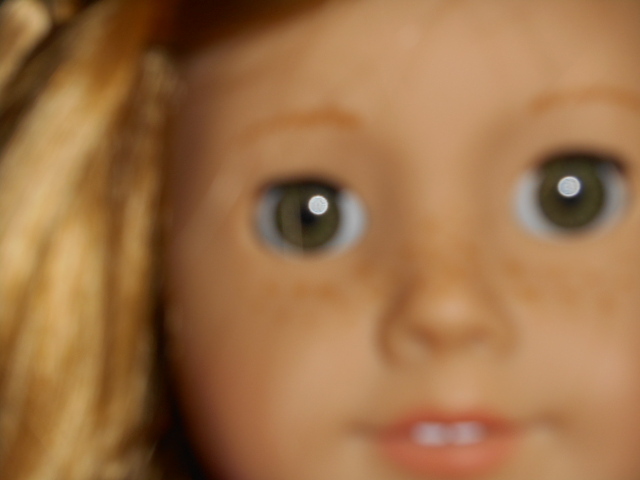 Her face is made of a different, plastic than the rest of her body, squeezable. She wears a crown. She has brushable golden hair. Her dress is beautiful, but the sleeves are done weird, like it is too big. 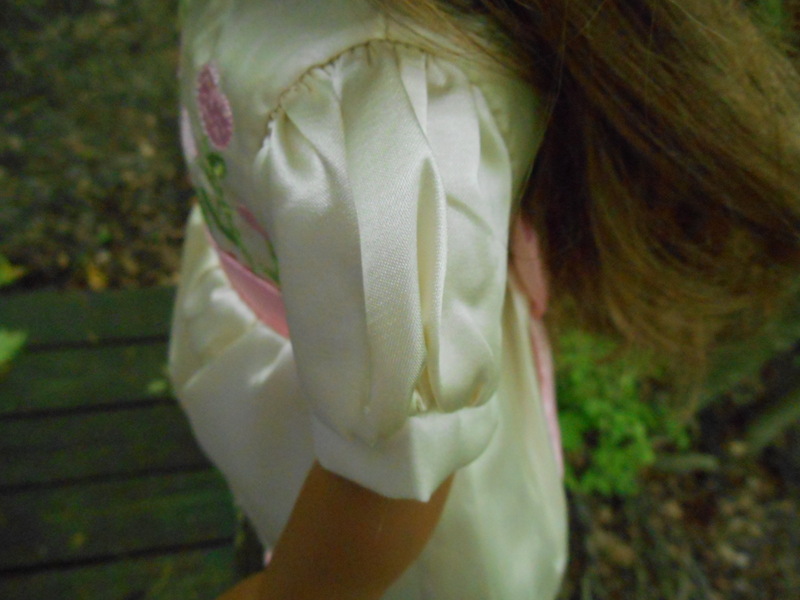 The bodice has seams, but one is already snagged. 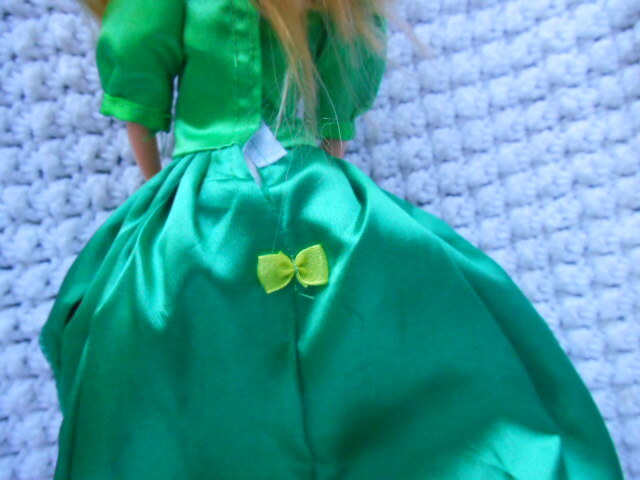 The skirt is very full with three layers, a plain layer, a layer with ribbons and bows, and a darker layer. 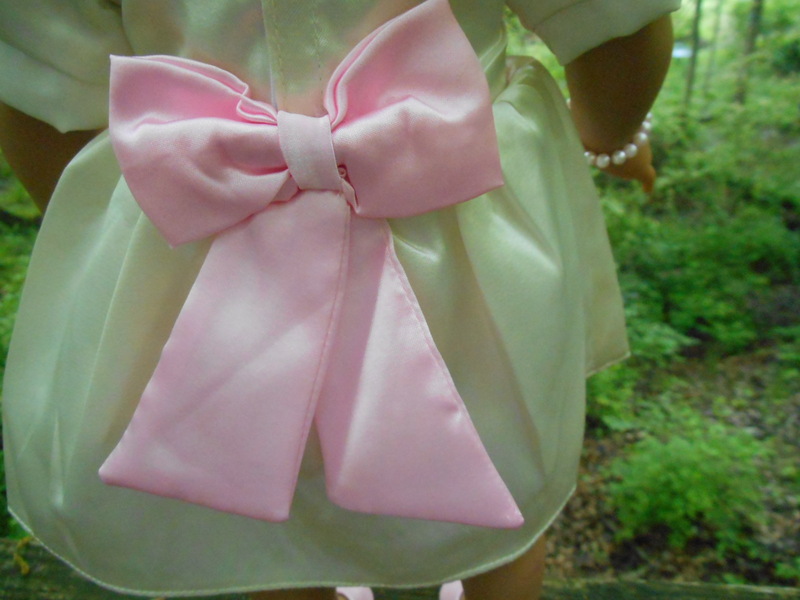 The ribbon and bows go all the way around, though you can’t see them. There is a bow in the back. 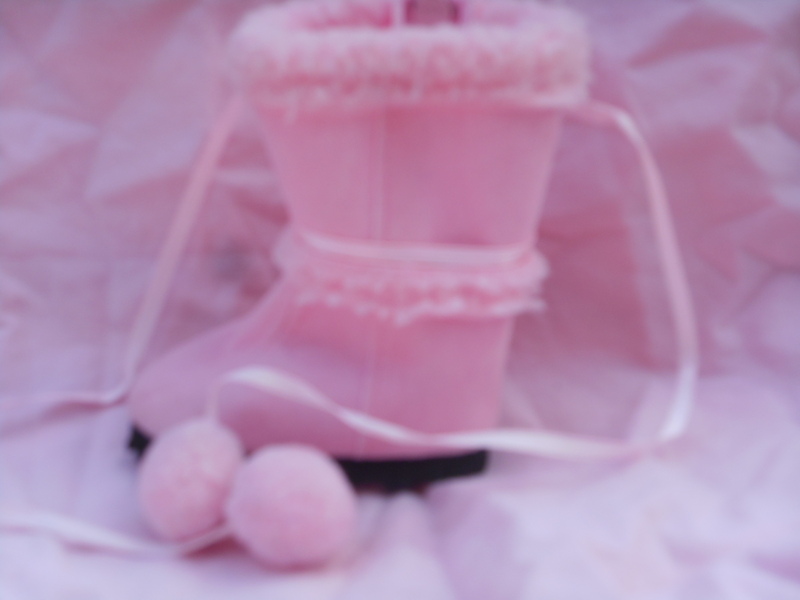 She wears pink high heals, but in the book she has boots. Her feet look made for the heals, and her feet are pink where the shoes were. Charity can’t stand without the fancy, full dress. She wears underwear. And the dress has velcro. 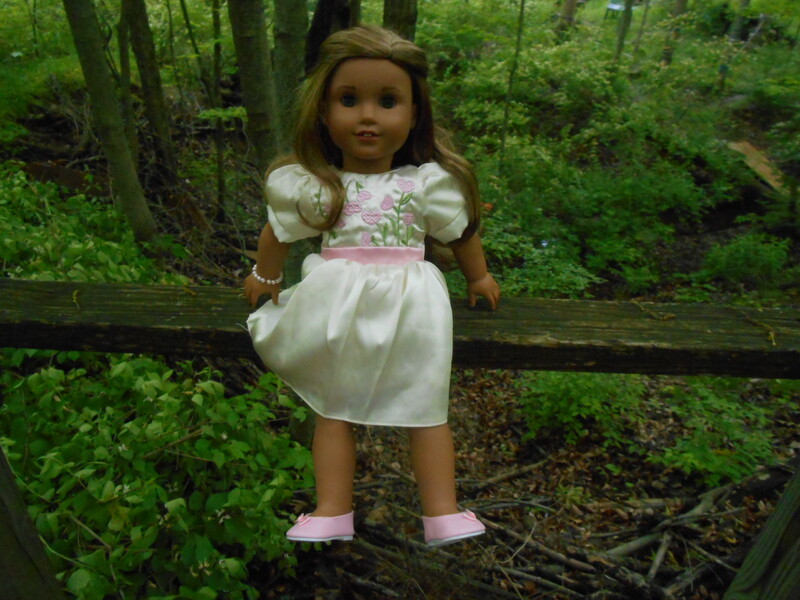 The doll looks older than in the book, and I don’t like that. 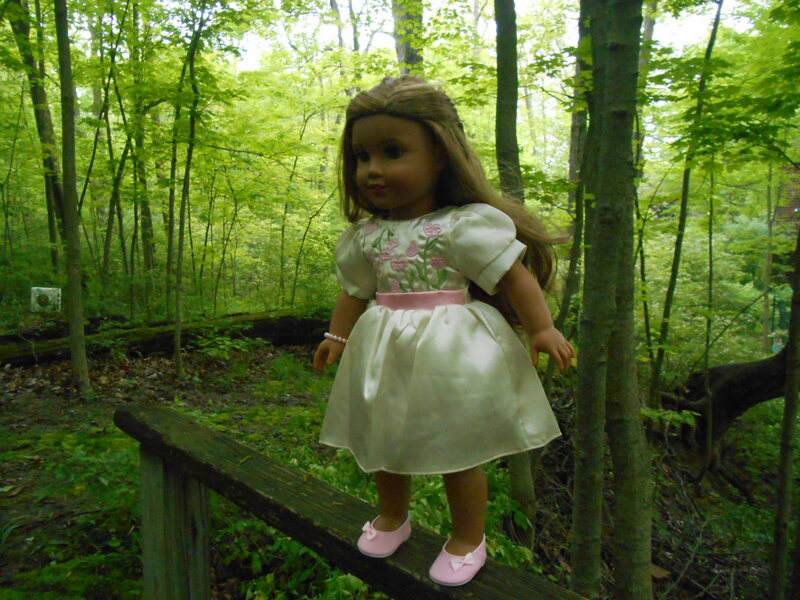 She is a wonderful doll, but mine will sit on a shelf and look pretty, as I don’t play with these dolls anymore. I rate her 4/5 stars. 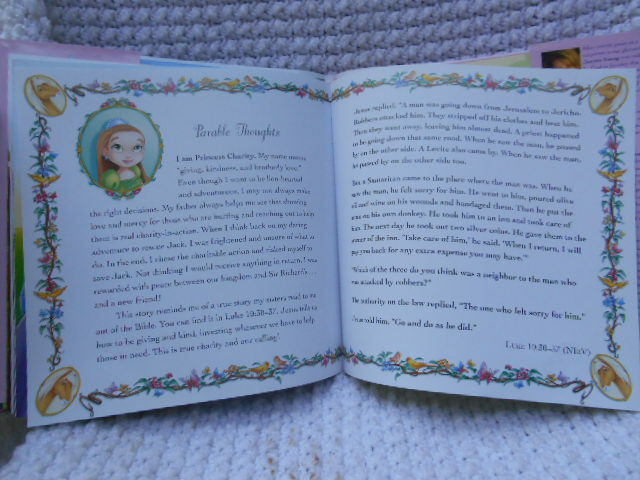 Since today is Thrifty Thursday I am going to review my first thrifted American Girl doll Mia! I took the pictures in the place I always do, even though the lighting there is bad, and it is not a great place for pictures. (It is a tradition.) I dressed Mia in clothes that looked like her meet outfit. The shoes are Grace’s meet boots, I made the sweater for Mia, and the skirt is the bottom part of a dress I made. Mia actually came with her underwear. I thought that was cool. Mia has three stars on her underwear, as that was when they still put logos on the underwear. She has the classic face mold, freckles that look like someone took a paint brush and made tiny lines, and hazel eyes that are very close to Lea’s. Pretty eyes. 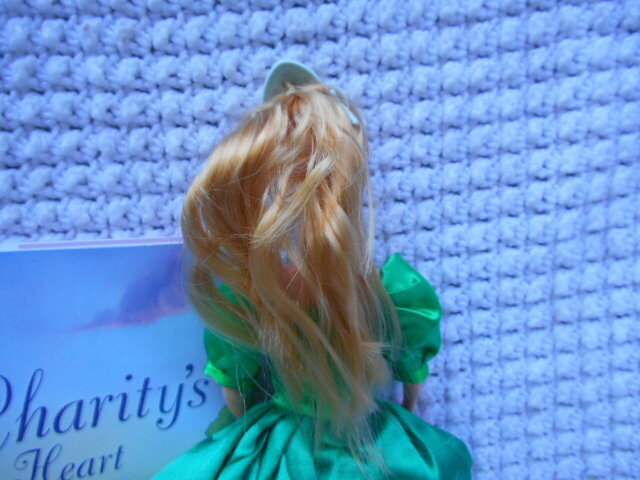 Mia came back from the doll hospital with her original hairstyle, a braid that looks like Graces from first glance, but really is very different. Grace’s is a french braid, Mia’s is a braid with hair going in and out of it. Her hair comes all the way down her back with a little bit of curl. It is a dark strawberry blond, not a true red. 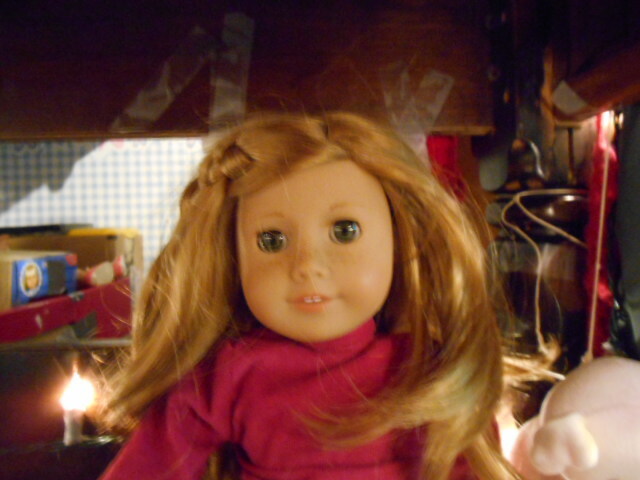 The trip to the doll hospital was about 57$ so I got her for 58$. 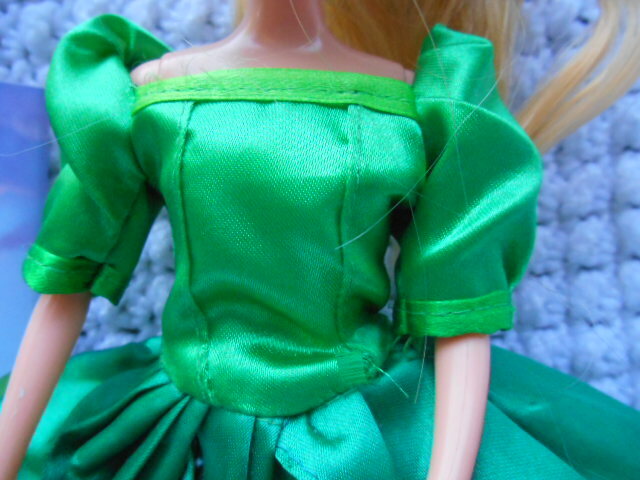 Even though she isn’t new, and she didn’t come with her meet outfit, I love her more than I would getting her when I was five. 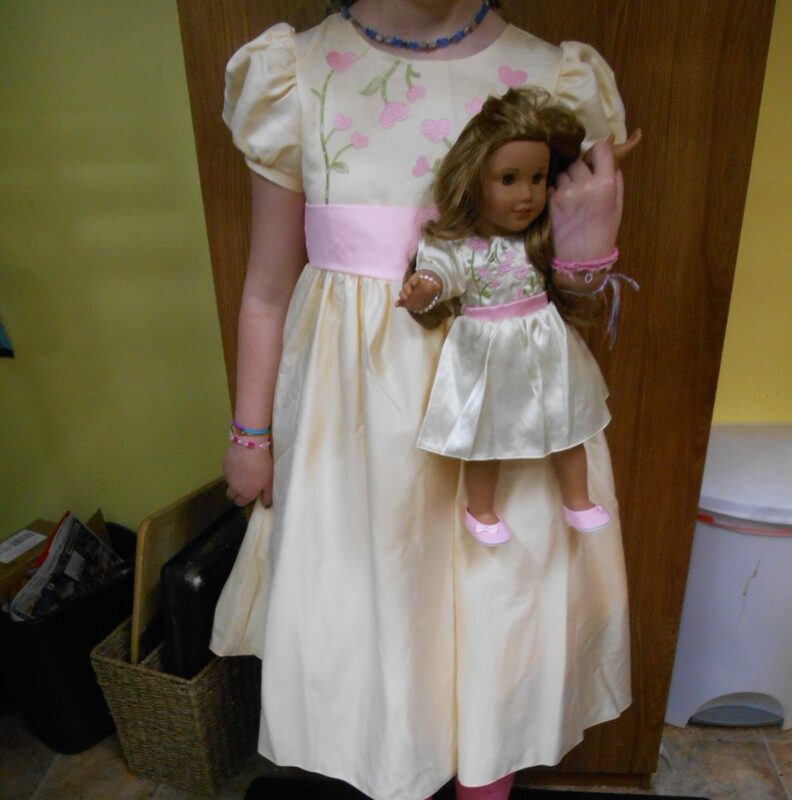 It has been a dream of mine to find an American Girl doll at a thrift store, and it finally came true! What time is it? 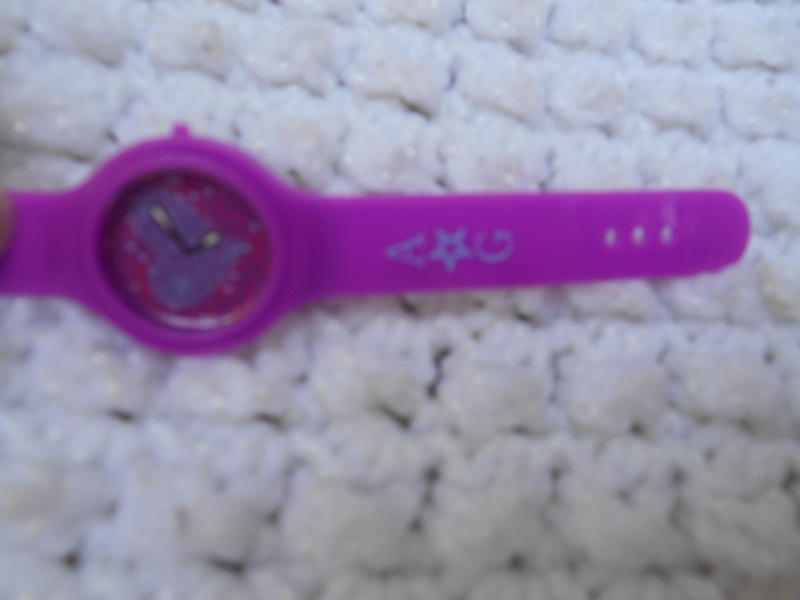 Time to review the violet heart watch! 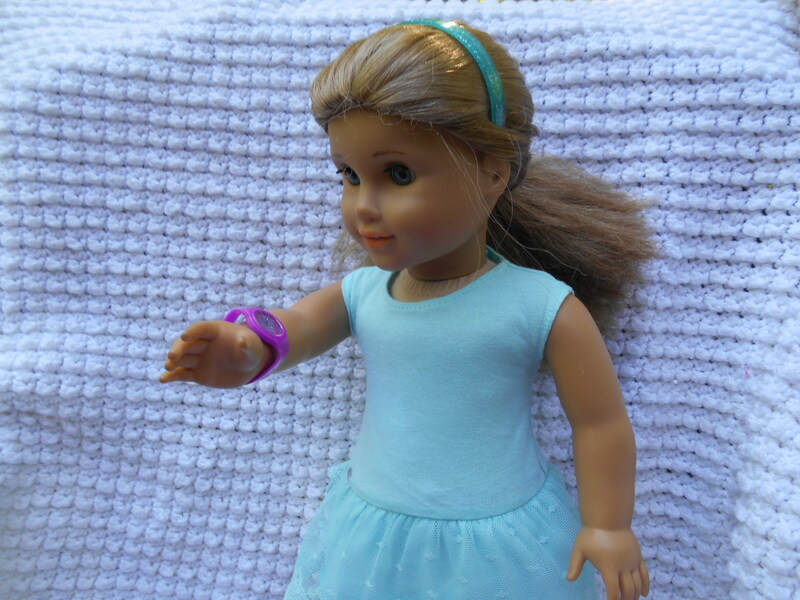 When I sent one of my dolls to the american girl doll hospital they were out of hospital bracelets so they sent me this watch instead. I have enough hospital bracelets of my own, my dolls don’t need any. I am glad to have a watch though. 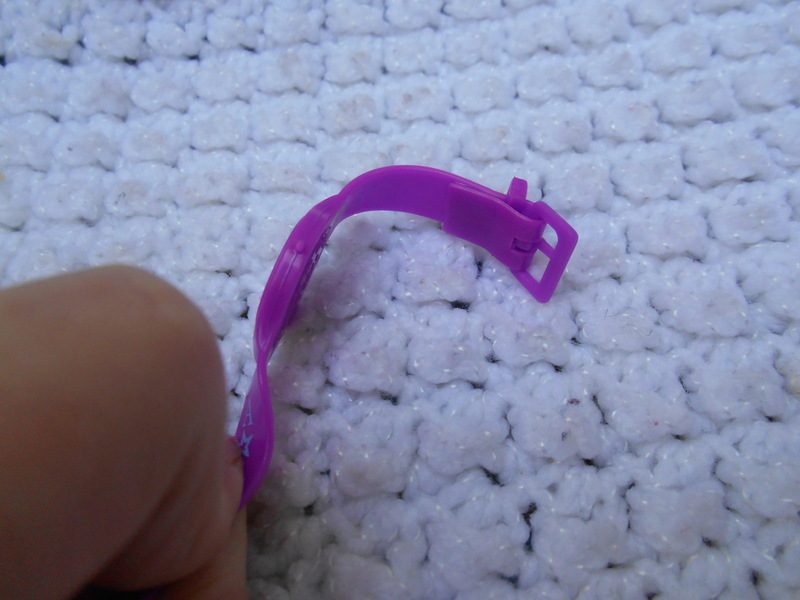 The watch is made of plastic with a buckle and a screen. It looks a little bulky around the watch part. There are no numbers, and the handles are just printed on. I hate this. 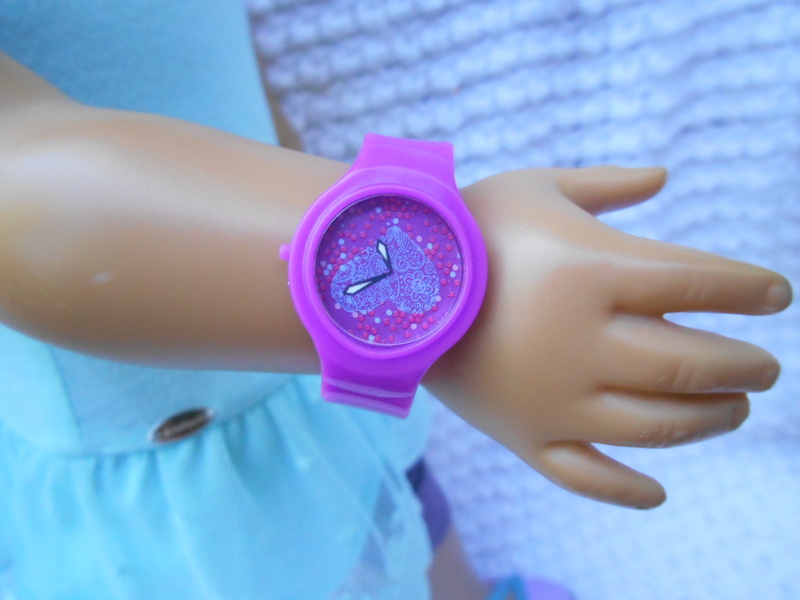 If I can buy a working watch at the dollar store why should I buy a not working 8$ doll watch? The strap says A*G and has three holes. The buckle really works, but although there are three holes it is really hard to get the thing in the last one. It would work for smaller dolls, but that would make it look really weird. I don’t understand this design, but I like that they put a working buckle on it. There is as button on the side. I wouldn’t pay 8$ for this, but I am glad to have it. It is a good addition to many outfits. I give it 3/5 stars. For Easter I got the My Twin Blooming Flower Dress and girl dress plus some shoes. I am going to review those things in this post. I put the dress on to model it, and it was a lot of fun, even though I am going to have to take it off here in a minute. 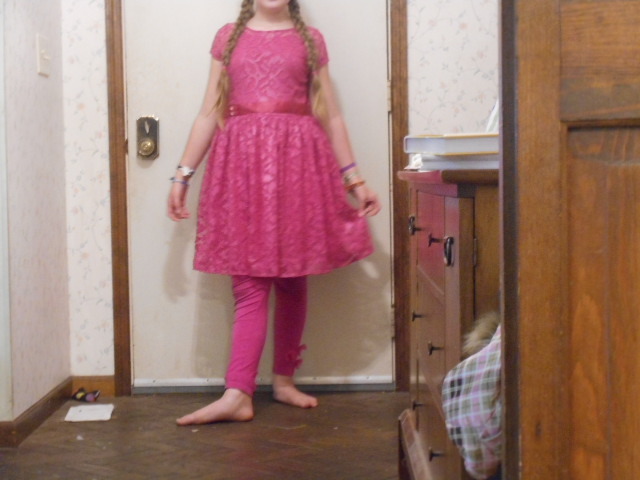 I decided not to wear it for Easter, but it is a nice dress, and I am going to wear it a lot. Here is Lea in the whole outfit. 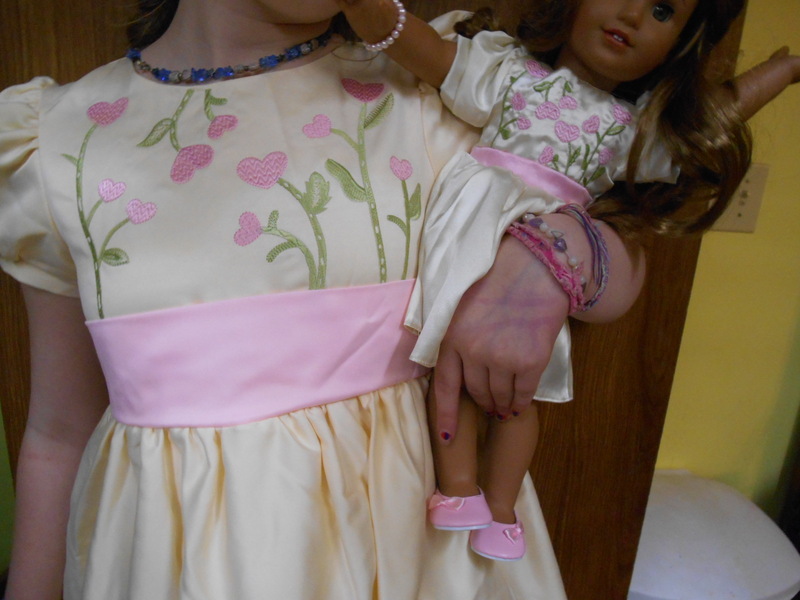 She is also wearing a pink pearl bracelet and pink hair clip. 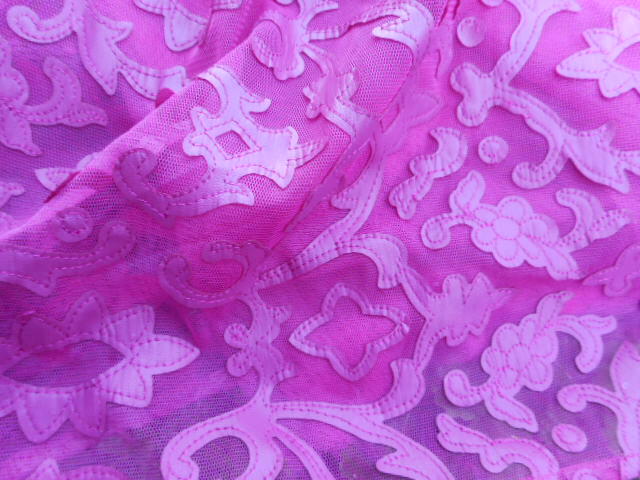 The dress is made of white satiny cloth, with a pink sash made of the same material. 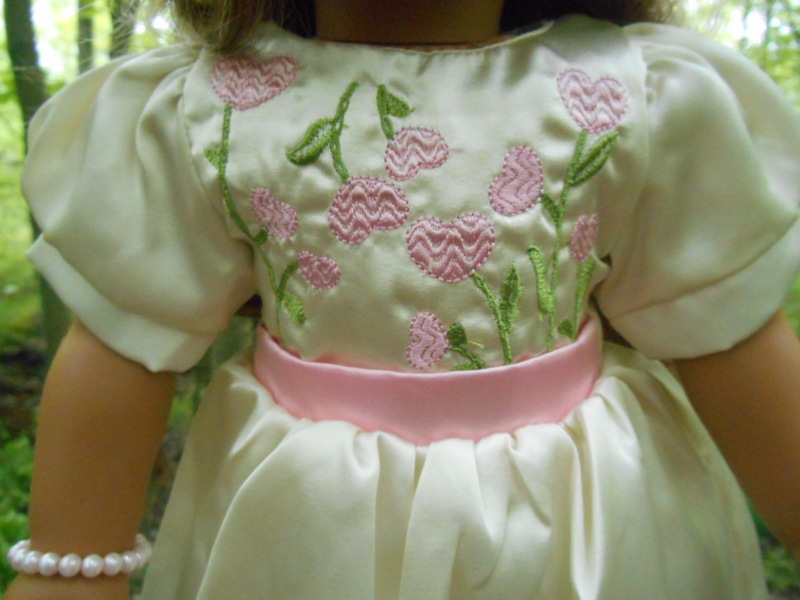 The front has embroidered hearts and stems, like a garden. The skirt is nicely gathered, there is a lot of cloth. The sleeves are puffy, with a band. 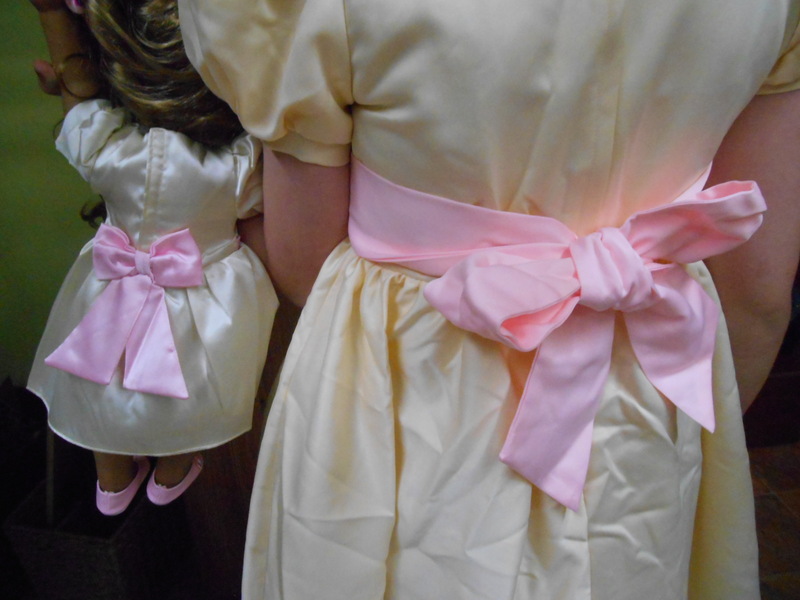 The sash doesn’t go all the way to the back, but a bow of the same cloth is sewn onto the back. The dress opens all the way to the skirt, but it was extremely hard to get on. It took me awhile. Girls the age the products are directed at would not be able to get the dress on without help. The dress has a slip, and mesh on top of that. It is sewn in place but to have it as a slip might be nice. Lea can sit well in the dress. 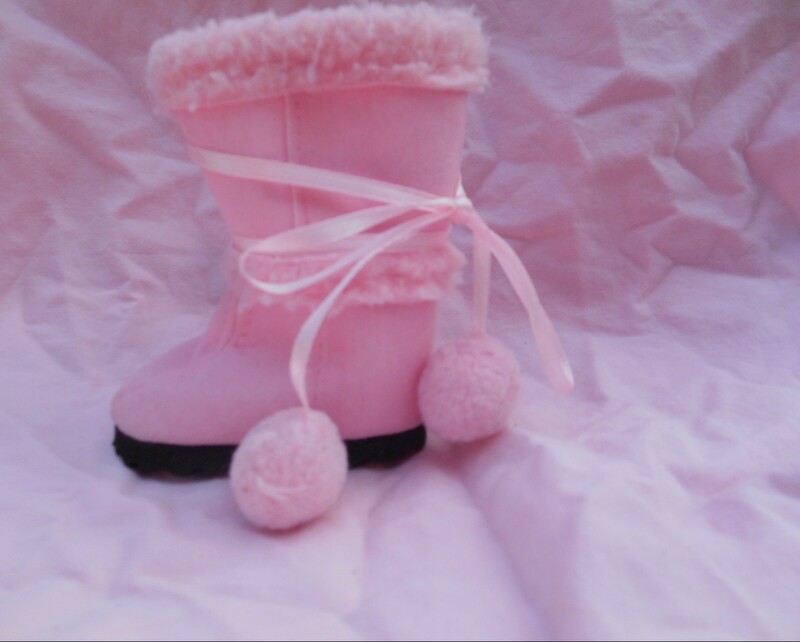 The shoes are pink leather like material with a pink ribbon bow on each shoe. They are slip on shoes, very easy to get on, but they stay on. 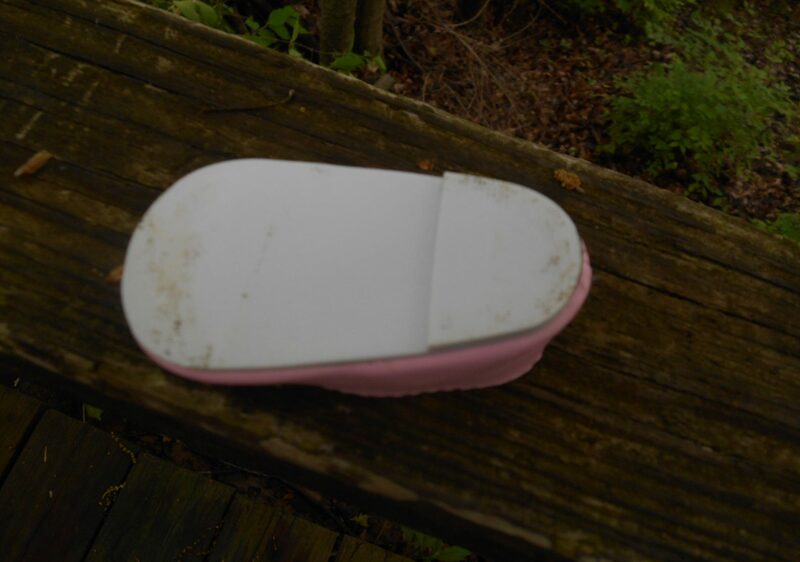 The sole is white, with a bit of heal. Here is me in my dress and lea in hers. Nether the dress nor sash is the same cloth or color. The girls dress isn’t shiny, but it will hold up better. The heart garden is the same, still embroidered. 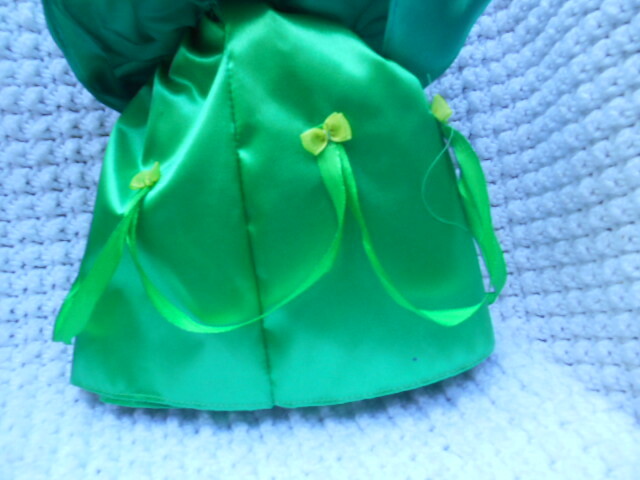 In the girls dress the sash goes all the way around and ties. All of the things were less than 20$ all together, a great deal for the quality of the items. They are well made, and I am glad I got them. A few weeks ago we got a new Hobby Lobby! We went to the grand opening, and I got some doll boots. They were five dollars, and I think they are worth what we paid for them. Here is Abby modeling the boots again. They fit well, and she can stand well in them. (Abby doesn’t stand well.) And here are the boots off the doll. 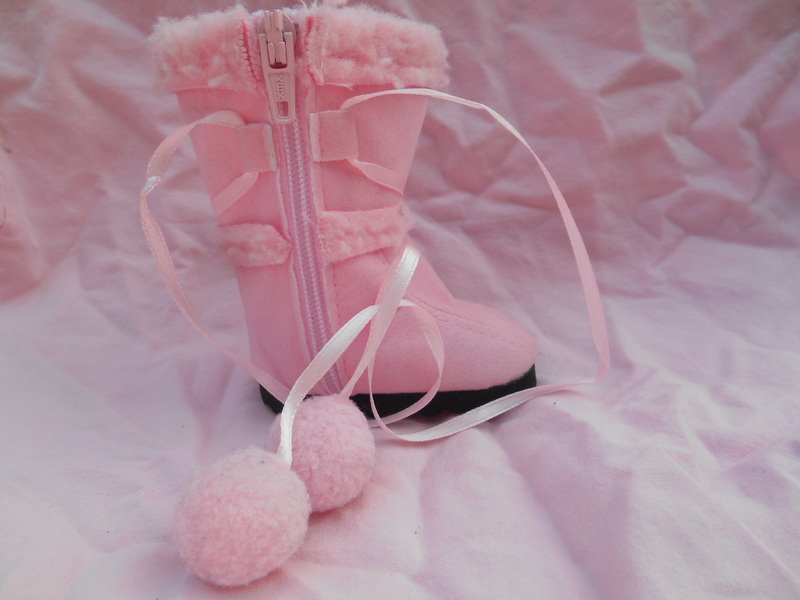 They have fake fur on them, and a ribbon with pompoms on the ends. In this picture you can see how the ribbon is attached. They also have a working zipper on the side, but it is more for show than getting the boots on and off. You can tie the ribbons, or loop them around an extra time. The bottom of the shoe is a lot like a real snow boot would be. Over all I love these boots. 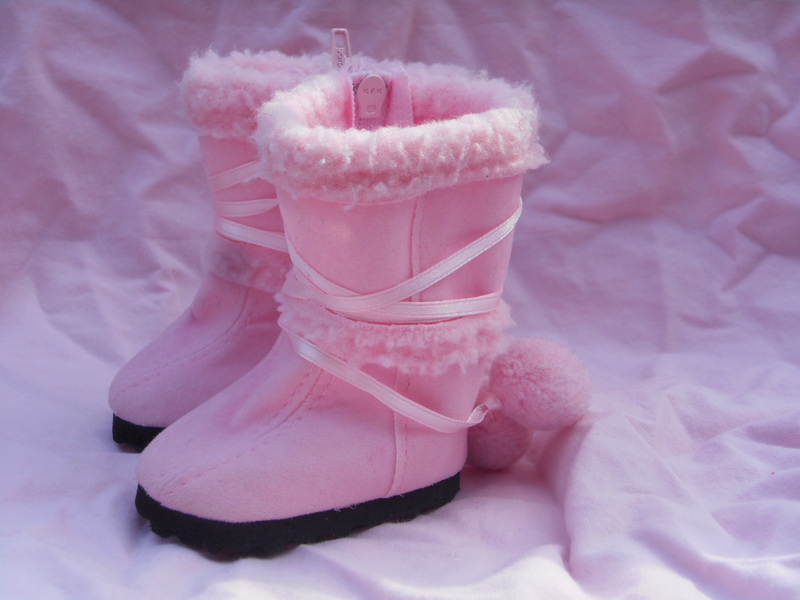 They are designed as snow boots, but they could work as fashion boots too, for summer or spring. On a scale of one to five I give them a six! What is it with Wednesdays being so hard to post on? As you saw with Tuesday’s post, I got Lea Clark! 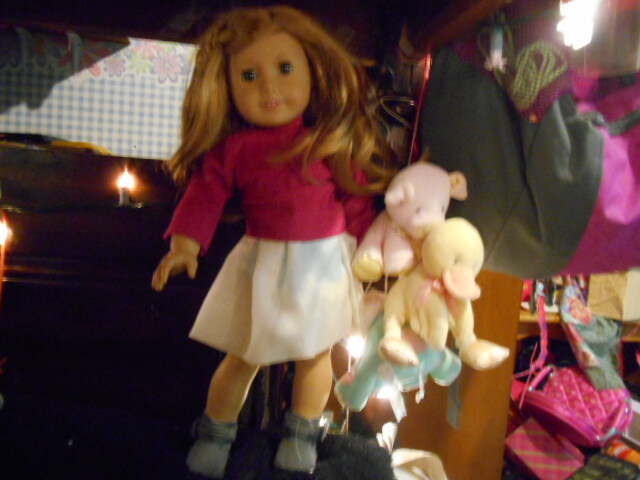 I went to the American Girl store last weekend (I have pictures by the way), and I had the money. So here she is! Lea Clark is ten. She goes to Brazil for her stories. As soon as I saw her, I knew I wanted her. It took me about two months to get her, but it was way worth it. We were going to be in Columbus, so I convinced Mom to take me to the AG store. I had to wait several hours, till the way home to open her. I am very happy with the one I chose! Here is Lea in her box in the car. (Excuse my knees!) She has here hair net on, and all the packaging. They have plastic ‘gloves’ now. Now here is Lea out of box! (This photo was edited, so the colors might not be true.) Here’s Lea’s dress. It had different stripes, each a different pattern. It’s short, but that can be fixed with leggings. 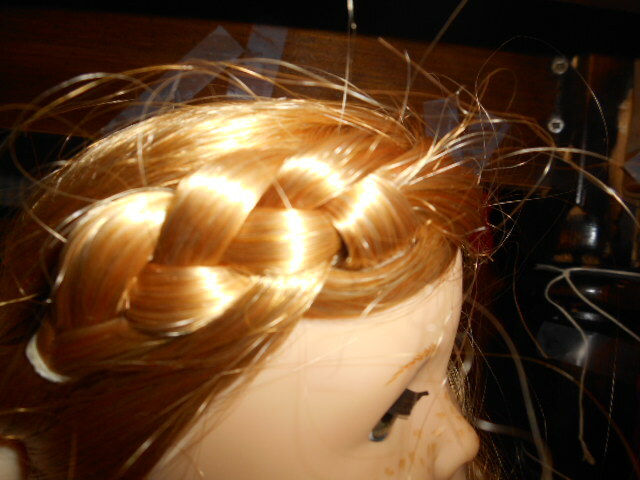 The top is braided yellow. This is annoying, because older girls can’t wear this dress without something under it. (Bras) The prints don’t match, and the braided belt doesn’t go all the way around. The prints line up in the back though. The bag’s strap have embroidered yellow Vs. The bag has two straps that hold the bag closed. They have a X pattern, and a yellow plastic ‘buckle’. It doesn’t work, but is a nice place to pull to open the bag. In between is her symbol. The bag opens with Velcro, and while isn’t as big as most of my bags, holds enough stuff. It could work as a purse. Here’s the compass. It has a arrow which turns, but the compass doesn’t really work. 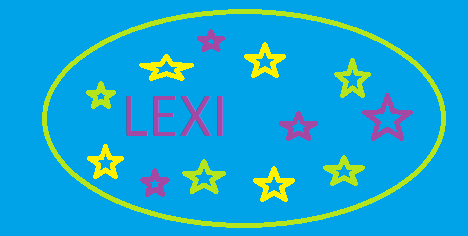 In the middle is a star. Here’s another view of it. The clasp is knots. You slide the knots around to make it longer or shorter. It was a little hard at first, but not bad. The longest it gets is still hard to get it over the head, because they have such big heads. Here are the shoes. The sandals will be great for the summer. 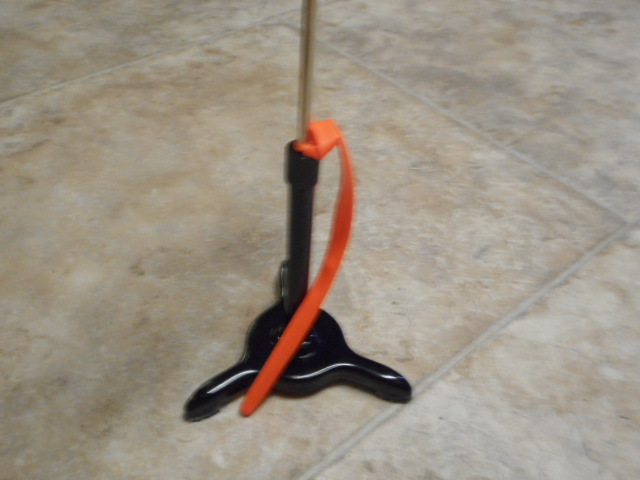 The back opens, but I don’t understand why, because the strings are elastic, and it doesn’t need to. She also comes with lime green undies. Lea has the Josefina face mold. She has tan skin, like she’s been out in the sun for awhile. She has feathered eyebrows, that make her look older. Her eyes are greenish with brow in them, and a black ring. I really like this. Hopefully in this picture you can see the highlights and colors. 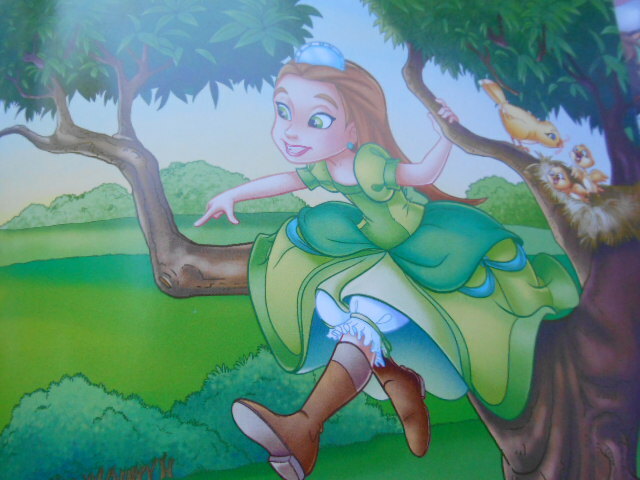 She has caramel/blond hair. Her hair was supposed to be curly, but it isn’t really anymore. It defiantly has a wave though. When the curls are pulled straight it comes almost to her knees! 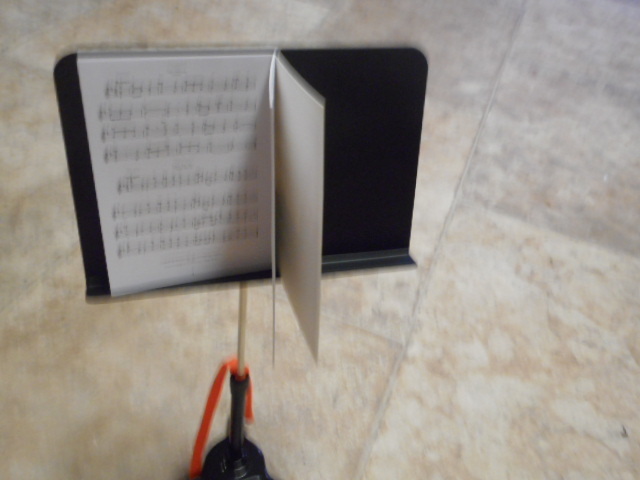 And even though this picture is blurry, you can see that they don’t have strings anymore. 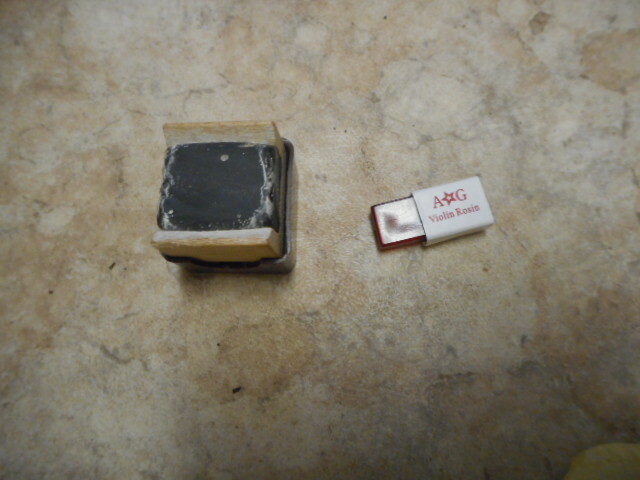 I hate this, but it will make pictures easier. Let’s just hope her limbs don’t get loose. 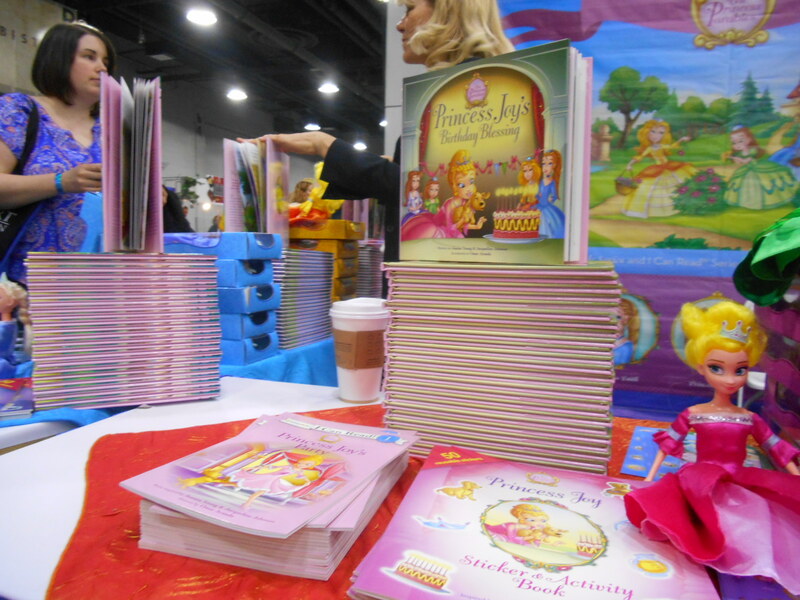 And here is her book. It didn’t interest to me as much as they books usually do, but it was still a good read. The title gives away the ending though. Anyway I LOVELOVELOVE Lea. If you are thinking about getting her, let me make the desion for you. GET HER! Can you tell I like Lea?